Fostering cooperative inquiry and experimentation in the cross-disciplinary area of polymer science and mechanical engineering is the cornerstone of Athlone Institute of Technology’s research commitment. In light of this, the Centre was established as an interdisciplinary knowledge provider in response to a recognised national need to improve the polymer/mechanical knowledge base and streamline the process of translating research results into industrial innovations and applications. Following a translational research approach, the CISD assembles faculty resources and leverages existing knowledge to help companies and government agencies address their challenges by creating opportunities for Ireland Inc.
To provide an environment where students and professionals from industry, government, and academia collaborate to identify and address pivotal multidisciplinary issues in engineering and technology in a way that creates awareness, produces knowledgeable people, and promotes the exchange of knowledge to benefit all. CISD offers extensive R&D and testing facilities of particular interest to companies in the plastic, medical and "pharma" sectors. Detailed research, testing and analysis can contribute significantly in troubleshooting processing problems, comparative testing of similar products and product quality integrity. CISD operates within a fully traceable quality system including equipment calibration, project tracking and machine maintenance. Each analysis is accompanied by a comprehensive report detailing results, but more importantly conclusions and recommendations drawing on the invaluable field experience of their research officers. Fostering cooperative inquiry and experimentation in the cross-disciplinary area of polymer science and engineering is a cornerstone of Athlone Institute of Technology’s research commitment. In light of this the Centre for Industrial Services and Design (CISD) was established (Formally the Polymer Development Centre) as an interdisciplinary knowledge provider in response to a recognised need to improve the knowledge base and streamline the process of translating research results into industrial innovations and applications. Following a translational research approach, dedicated resources leverage CISD’s knowledge and expertise to help businesses address their challenges in a confidential manor. CISD offers extensive Chemical Analysis, Physical/Mechanical Analysis, Failure Analysis, Product Testing, Quality Control, Formulation Development, Food and Packaging Testing, Surface Analysis , R&D, design, prototyping and Consultancy. The Centre is of particular interest to companies (from start-ups to multinationals) in the polymer, medical and pharma sectors but with applicability across a broad range of industry/enterprise areas. 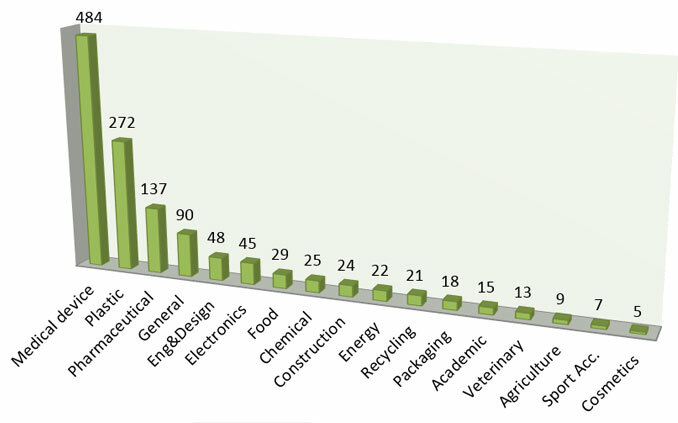 CISD has a strong focus on supporting start-ups and SMEs that have some in-house scientific or technological capacity, but not sufficient to engage in formal R&D activity, to make the transition to R&D performance. 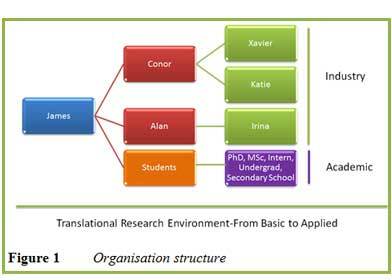 An overview of the Team is present in Figure 1. Our Centre aims to be the ‘partner of choice’ for industry and recognises the importance of servicing the ever-evolving demands which this brings. The evolution of the Centre’s research platforms are influenced by developments and trends which we have seen in Industry. This has augmented our capacity to respond rapidly to meet short and long term needs and goals of industry. Where we differ to other Academic Testing facilities is our dedicated calibrated equipment and industry focused staff which give us the freedom to provide time efficient analysis, which is a must in a fast paced industrial environment. The impact of each interaction is unique to the company. 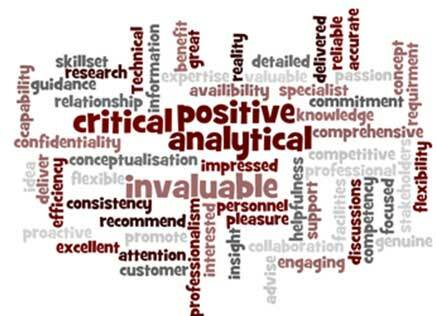 Analytical projects conclude, not only with a comprehensive report detailing results, but more importantly conclusions and recommendations drawing on the invaluable experience within our team. Such recommendations often help companies decide future material selection, key design features and life cycle improvements etc. 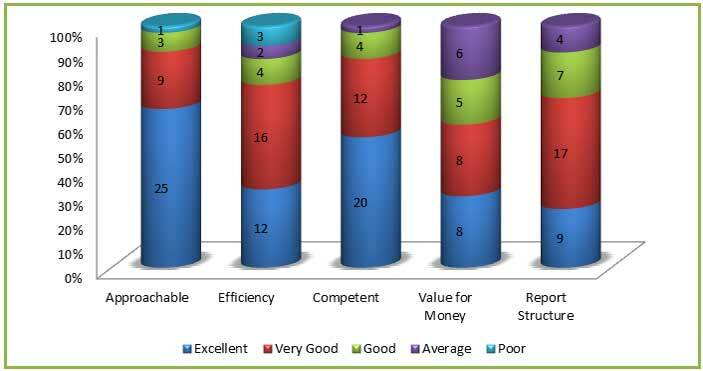 A result from a survey completed by 38 of our clients outlining our service is presented in Figure 2. 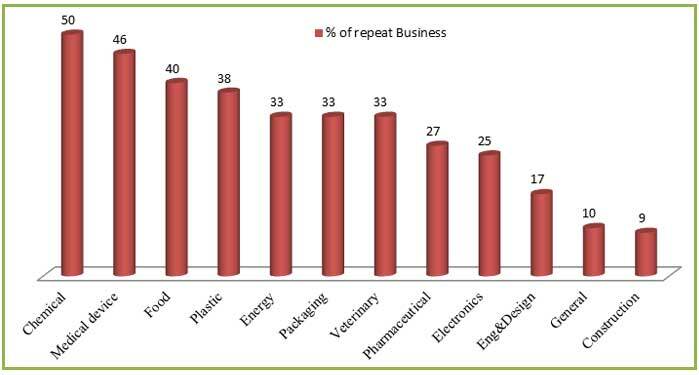 A reflection of our quality of service and relationship with our clients is reflected in the % of repeat business we have each year. 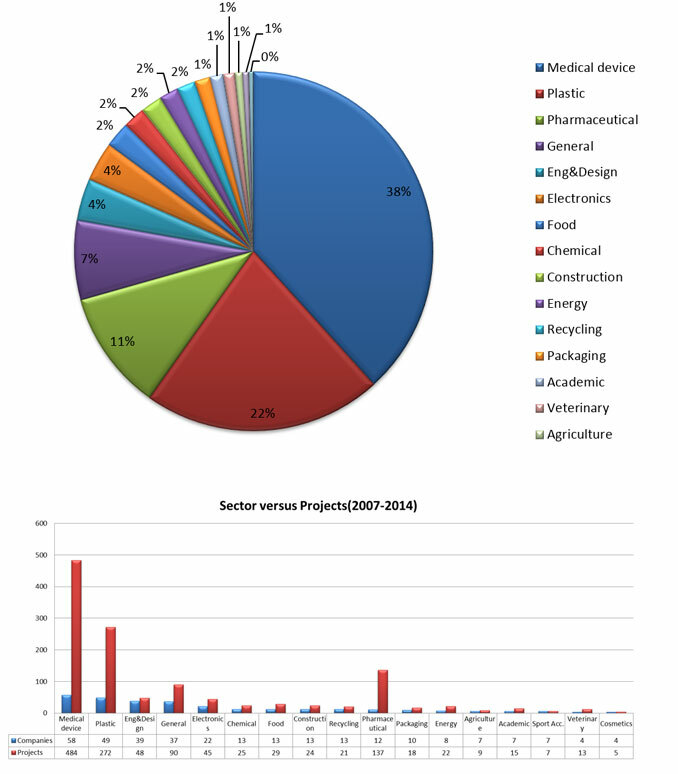 Our repeat business with our clients is broken down into the sectors as presented in Figure 3. To date our creditability has travelled by word of mouth and reputation, and this will be also be reflected in our website when we launch it later this year. Traversing academia and industry, our work is informed by industry interaction and vice-versa. We develop products and improved existing technologies while acutely aware of their precise application and usefulness to the final customer. In a recent article (March 2013) from Business and Leadership, titled “Breaking new ground with hands-free working in the oil and gas industry – OHS”, a range of products developed and tested from the Centre for Offshore Handling Systems was credited for the development of the product range (http://www.businessandleadership.com/exporting/item/45004-breaking-new-ground-with-ha). "Within 12 months, researcher and designer there Conor Hayes had fine-tuned Earley’s five product ideas and he was put in touch with a company in Athlone, Rotafab, which now looks after the moulding process. In early 2011, Earley got a second innovation voucher, which he said was needed to make the products look tested and proven. The researchers at the Polymer Institute carried out strength testing to see how long they would last in salt water or high temperatures and all products now have a full test sheet to reinforce their quality…"
From 2008-2014, 140 Innovation vouchers( In 2012 and 2013, AIT was no.2 in Ireland for completing the most vouchers) have been completed and here are some of the examples of the products CISD has helped the companies to bring to market.